At 4:30 the trusted alarm went off which started the process of getting ready for the day. Gradually waking up, thinking about the day ahead, determining which muscles are screaming from the previous days paddle, taking in some food, and doctoring the body. Thankfully the change in how I was doctoring my leg was working, the wound was drying out and the red streaks were shrinking. Still, l find it odd that even today I get a pain in that area when it is getting ready to rain. I believe it has to be a mental thing and not something physical. 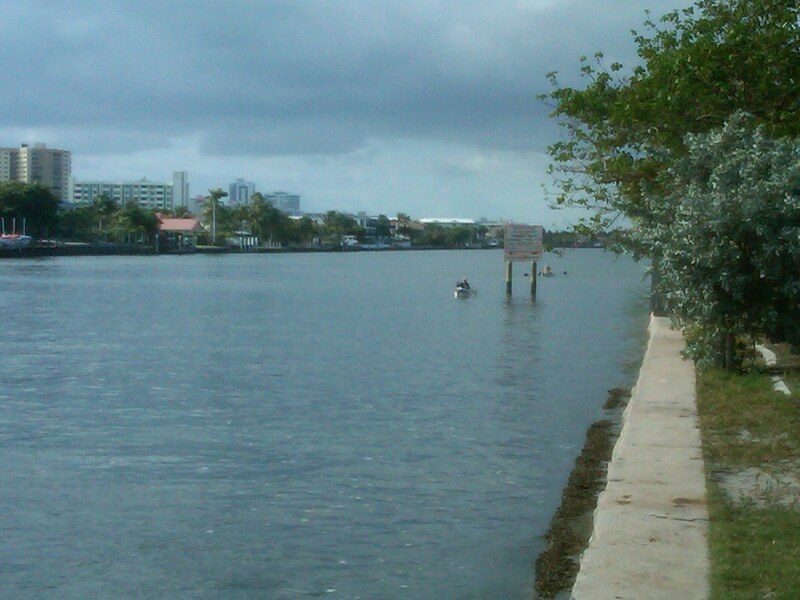 The one nice thing about being in the intracoastal was not having to worry so much about what the wind would be doing. I don’t know about Rod, but I had my fill of wind blowing in my face 15 hours of the day. Paddling in the early morning hours and in the evening are my most favorite times to paddle. It is usually cooler, the boat traffic is almost non-existent and the weather is usually the calmest. It was not different this morning. The unique thing that was waiting for us this morning was paddling through in the early morning hours through so much money. We were entering the West Palm Beach area and the money there blew my mind. The yachts, the homes and the property were unbelievable. The US Navy has a fleet and West Palm Beach has a fleet too. Their fleet looks a lot nicer than what I remember of the vessels I was on in the Navy. The question that was coming into my mind was where does all the money come from? Oh, and with all that money comes security. A kayak is supposed to have a white stern light on during the night hours. The only problem is that it can mess your night vision up. Rod has his light mounted on the stern but to one side so he can easily turn it on and off. This lets him keep it off until he hears a boat coming and then he turns it on. So here we are, 6:00 in the morning, cruising along the side of the channel, in the dark, with all this money around us, and you guessed it, a police boat pops out because Rod doesn’t have his stern light on. I guess we looked harmless because the officer didn’t keep us long after Rod got his light working. Ahhh, West Palm Beach is still safe and secure. Most of this day was spent paddling through one group of condos after another. One yacht marina after another. Finally, I could tell that we were getting closer to the St. Lucie inlet when instead of yachts in the marinas, there were boats. St. Lucie inlet was also where we were transitioning from the parts of the intracoastal that were very narrowed and protected to the wide and exposed Indian River. The crossing of the St. Lucie inlet was pretty non-eventful, which was a relief. I had some concern about how strong the tide would be going through this area but we hit it just right. The tide was minimal and we didn’t have any confused seas to paddle through. Hey, maybe today is our day. The Indian River is an interesting area to paddle in. It is a wide body of water, not very deep (6 feet ), and lots of big tall bridges. Rod used the phrase, “building of a bridge” while paddling through this area. How true that is. In a small boat moving at 3-4 knots you can just see the outline of the top of a big bridge 7 to 8 miles out. The same is true at night when it is lit. So there is your goal and it is kind of uplifting because you can see the end. What you don’t think about is even at 4 knots it will take you two hours to get there. Two hours is a long time. So you see the top of the bridge and you put your head down and paddle, paddle, paddle, and then look up. Now you can make out the top of the bridge and you can just start to make out the top of the piling for the bridge coming down. So you put your head down again and paddle, paddle, paddle, and then look up. Now you can make out the top of the bridge, you can see the pilings going down from the bridge to the water but the structure is pretty blurry and you really cannot see any details to the structure. About this time you are getting the feeling this thing is a long way away and you have a lot more paddling in front of you. But you can see the end so it has to be close. Hint, hint, you still have about an hour of paddling in front of you. So you put your head down and paddle, paddle, paddle, and then look up. Ahhhhh mannnnn!! Who keeps moving this bridge back? Now you can see the bridge structure and the pilings in some detail but cannot see any cars. Maybe a large truck but even that is questionable. So you put your head down, paddle, paddle, paddle, and then look up. Ok, this is really getting old. We will never get to this bridge. Just how far away is this thing? So you put your head down and paddle, paddle, paddle, and then look up. Finally, you can start to see some cars and for sure large trucks. This has been a killer getting to this bridge. So you put your head down and paddle, paddle,paddle, and then look up. The bridge has been built! Cars and trucks are clearly visible, the details of the bridge are clear, you can see the rocks for the foundations of the bridge entrance and exit ramps and the bridge is coming at you in a way that it makes you think you’re paddling speed has doubled. So for me, it was kind of an emotional roller coaster paddling through so many bridges on the Banana River. Different Watertribers reward themselves differently for each bridge they paddle through. Our reward was seeing if we wanted to stop and do some stretching. Sometimes we did, sometimes we didn’t. This is a picture of me at one of the bridges. Nice outfit huh? In case you were wondering, I wasn’t going for a men’s fashion award. This day started off with us paddling through so much money, and then transitioned with us paddling through lots of open spaces going from one bridge to the next, and now the sun was starting to set. Now Rod hadn’t had a restaurant fix so guess what paddling pattern was starting to emerge. The only problem was we were in some wide open areas so there was going to be no paddling from side to side looking for a place to stop and eat. It was going to be pick a side and see if something is there. Sure enough, he finds a place. A nice barbecue restaurant that not only had a lot of people in it but also hanging around at an outside bar. Now you know what I looked like from the picture above and I do have my limitations. There was no way i was going to walk into a restaurant looking like that. It just wasn’t going to happen. So we land at a beach a little down from the restaurant and lucky for me there are some trees and heavy brush close by. I knew we could refill out water bottles from one of the outside water faucets at the restaurant so “Mr. Clean” does a quick field bath in the woods and changes into some relatively clean clothes. I am so glad a lot of people don’t know me on the east coast. Could have been real embarrassing. As it is, probably most people thought I was another homeless person. After getting into the restaurant and tasting a cold Coke and having some fresh cooked food, it was worth it. I would do it again in a New York minute. What made this stop even more important was that we were planning to paddle late into the night. We knew that the more miles we covered today, the less there would be to cover tomorrow. 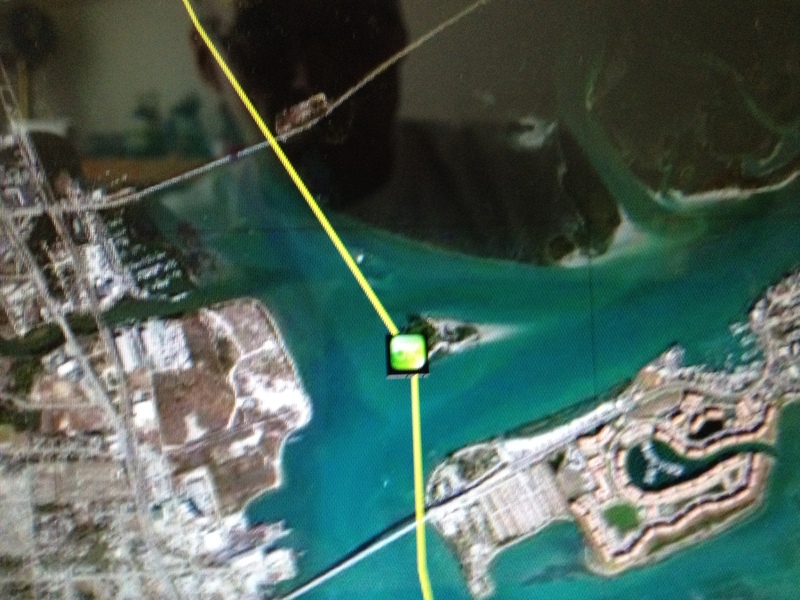 That would in turn put us in striking distance of Sebastian Inlet which was (CP2). 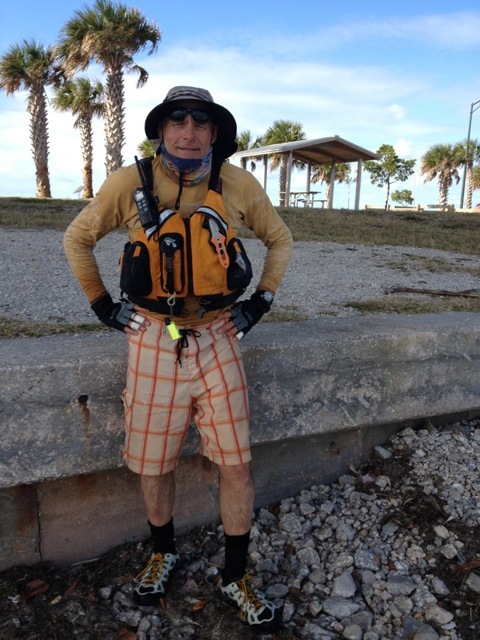 We ended up paddling until 12:30AM that night and stopping at an island near the entrance to the channel to the Ft. Pierce Inlet. The last half mile was touch and go due to the tide. It was rushing in from the inlet and it was extremely strong. We were already exhausted from the long day and it was a fight to get across the channel to the inlet. In the end it was worth it. The island had a nice beach, high ground and no one to mess with us. Ahhh, the simple things in life, a good night sleep. Where the Everglades were wild and remote, the section of the intercostal that we were heading into was very populated and built up. In the Everglades it was hard to find a place to stop due to the lack of solid ground. Now it was hard to find a place to stop because the sides were solid sea walls and private property. We were entering what Watertribers call the “Concrete Canyon.” Having now paddled this section of the course I do understand why they call it that. There was one positive to it and that was there are a lot of speed zones. Those boat captains who seemed to be either ignorant or indifferent to their wakes, now had to slow down. In fact, we found ourselves leap-frogging these boats. They would pass us and then have to wait for a bridge opening. We would pass them and then when the bridge opened the whole process would start over again. Wonder how it feels to be on a $2 million speed boat and have two small canoes pass you multiple times. That was our revenge. Especially when the bikinis on the deck point out to the captain that we were passing them again. Ahhh, the simple victories of life. The other positive to this section of the water was that I didn’t have to use my skirt and I could open up my cockpit to the sun and fresh open air. This is what I needed to heal the wound I had been trying to manage since the first day of the UFC. Since Key Largo I had been following a protocol of applying neosporin and changing the bandage frequently. It seemed to stop the progress of the infection, but it wasn’t healing completely. Bottom line, it wasn’t getting enough time to dry out. The four to five hours at night wasn’t enough for nature to put its protective band-aid on it — you know — a scab. With my amas out I could pretty much put my leg wherever I wanted. As we were approaching a bridge, I heard and saw two male figures standing on the west bank of the intercostal. They were pointing and waving at us. Hey!!! It was two folks I work with who work locally. It was so great to see them and was such a moral boost. This is a picture they took. Notice the smile? We didn’t stay long at that bridge, but the few minutes talking to them was priceless. Thanks guys! Now I think it was at this stage of the race that I started to understand just how serious Rod was about stopping at restaurants to eat. Rod’s interchange with my fellow co-workers was something like, “Hey guys. How are you doing? We are doing Great. Hey, where is the closest restaurant that is on the water and serves breakfast?” Rod was on a mission and it was a tactic that got more and more interesting the longer we had gone without a bath. My co-workers didn’t know of one but it wasn’t long after we passed under the bridge that Rod found a place. The funny part is that when we got into the place, they couldn’t serve us because the county was doing some kind of inspection. Glad the inspector didn’t see us. Don’t know which would have been worse, the kitchen or us. I am sure (at least I hoped so) we were dirtier and stunk more. We did buy a bunch of pastries and juices. I needed to keep taking in as much high fat foods as I could. I was still losing weight at an alarming rate. The rest of the day was spent paddling through one concrete canyon after another, house after house. And I mean huge, big houses. Where does all the money come from? It was pretty boring paddling, but it was progress. It was starting to get close to dinner time when Rod started to get the urge again. I could tell when he started to move from one side of the channel to the other. The restaurant blood hound was on the hunt. Hey, we have stopped once already today. I know that it wasn’t a great meal stop, and it was early, but right now it was suppertime and Rod wanted a meal. Oh, by the way, we were in one of the more expensive and exclusive parts of the east coast. These people are rich and up-scale folks. Now Rod was an aide to US Senator in a previous life, and had some time in politics, so he doesn’t meet a stranger. I, on the other hand, am a lot more reserved and until I get to known you, I am perfectly ok with staying strangers. I couldn’t believe it. Rod has identified this restaurant that had a sign on the dock telling people if you needed docking assistance to call them. Oh gee, I bet they have guys in white shorts, shirts, and deck shoes to run out and help tie you up. Oh, and look at all the open air booths with folks sitting and drinking their martinis and fancy drinks with those little umbrellas. Really?! We are going to stop here? Oh yeah! We will dock our mega boats and really impress them by docking without calling for help. The real trick is not the docking, but not falling in the water getting out. Well I couldn’t believe it but Rod walked right up and asked for a table like he owned the place. Now get this, they not only seat us, but they seat us right next to this well-dressed couple celebrating her birthday. I was way out of my comfort zone, but the thought of a cold Coke and fresh food overcame my desire to talk Rod in to a take out order. I am not sure they do that sort of thing at this restaurant but I figured they might have made an exception to get us to leave. Well, by the time I got back from the bathroom — you know, the whole Mr. Clean thing — Rod has made friends with the couple. The woman is taking pictures of us and is showing us pictures of her dogs on her cell phone. She has actually pulled her chair up to our table and the guy she is with is asking all sorts of questions. Unbelievable, but as I found out during the race, this is not unusual with Rod. He makes friends easily. I must admit that Rod’s tactic of stopping and getting some fresh food was a good one. I felt so recharged after those stops and I think they really helped in slowing down my weight loss. Other than the start of the day, it really wasn’t a bad one. We had reached our mileage target and then some, had pretty much avoided the wind, and had a good meal in us. Now if we could find a good camp site. We were in luck in that we were able to locate a spoil island called Fisherman Island in the West Palm Beach/Lake Worth area. So we were paddling in high-end areas, and we might have been eating in high-end places, but for sure we were not sleeping in any high-end hotel. Really couldn’t complain though. The winds had picked up quite bit which made pitching the tent a challenge but it sure kept the bugs off. The folks in this area either didn’t seem to trash their island or they had someone come out and clean the trash off of it. Either way, it was clean. 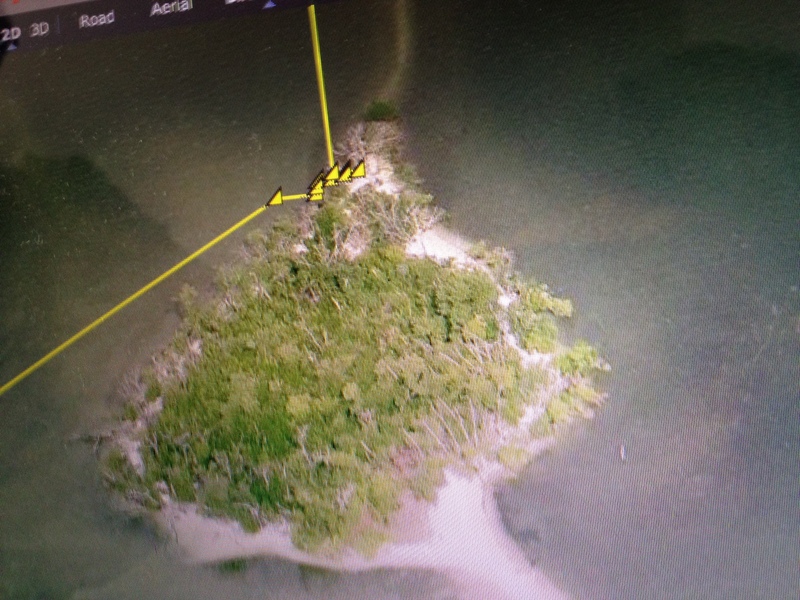 Luckily it was an island not close to shore and that meant no worries of anyone hassling us. It is always interesting to me how easy it is to locate something on the map, how close everything appears on the map, and how clear it looks on google earth versus how things and distances appear at night in real life. Nothing is as close as it appears on the map and nothing is as clear-cut as on the map. I guess that is the reason why so many people get lost even with a map. Well, another day had come and gone and we were making progress. Wonder what tomorrow will bring?………. I slept great that night and wished I could have slept longer but we needed to be moving while it was still dark. 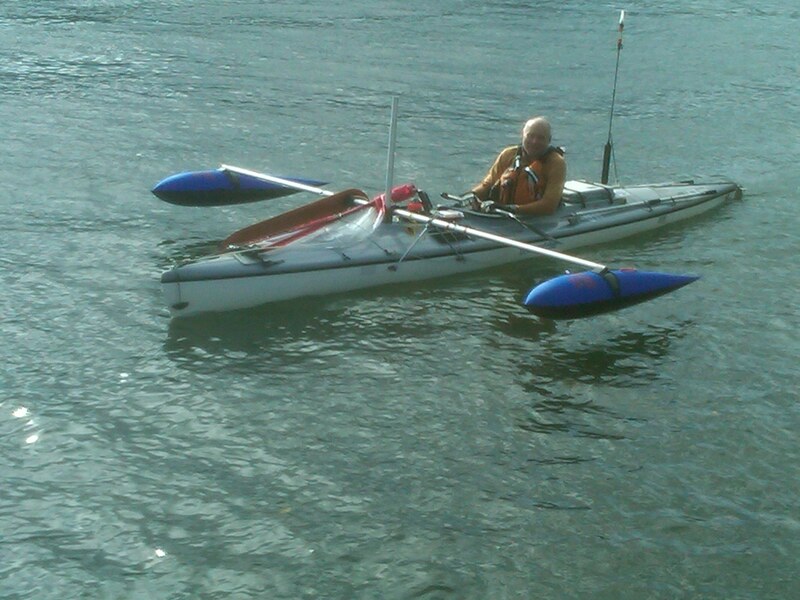 As we paddled up the intercoastal we could tell the wind was blowing pretty strong from the east but we had the protection of the intercoastal. For once we were not fighting the wind. We were making pretty good time and approaching a major port called Port Everglades. 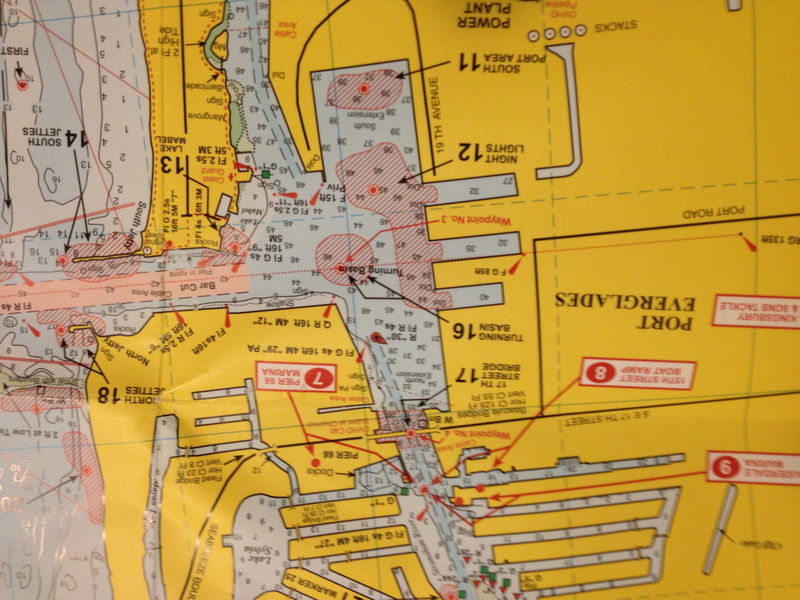 This port has a lot of ship traffic, both cargo and cruise line. The ships are big with limited maneuverability which means little boats need to have their “A” game on and be prepared to take whatever actions you have to in order to stay out of their way. “Rules of the Road” are the big guy has all the the rights. This is a picture of the port with north at the top. We were approaching from the south through the intercoastal. As we got closer to the port I saw this huge cruise liner coming in. The thing was so big that at first it looked like one of the condos that lined the beach. 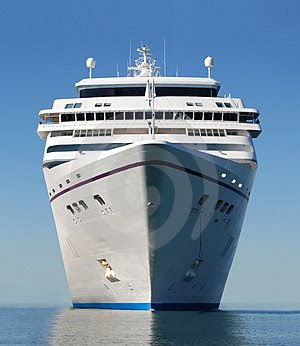 A few important questions quickly came to mind… Where is this Godzilla of cruise ships going to dock? How do we stay out of its way? And, how soon will it be before port security detects us? Of course they will hold us for whatever questioning they feel necessary. I mean think about it, from their viewpoint who, other than someone up to no good, is paddling this early in the morning, in the dark, in two small stealthy boats, in the middle of Port Everglades, next to a huge cruise ship?! Yeah, we are in for some serious interrogating so get the IDs ready. Rod’s expertise is paddling rivers. My expertise is the open water and I have experience dealing with ships. So I am the one pushing Rod to stay as close to the eastern shoreline as possible. I want to stay as far away as possible from this big boy and also see if we can get past port security. The plan was that once the ship passed, we would pass behind its stern, then shoot across the channel and pickup the intercoastal north of the channel. I thought the ship was going to turn south and dock starboard side on the west side of the channel. This would have the stern moving away from us and this would also have been the best maneuver for us to get past. Unfortunately for us, it didn’t do that. The ship came in, stopped, then started to twist the stern around and dock port side to. Great! We were already heading out into the channel and this ship is now twisting around and the stern is consuming real estate between us and it. A little stressful. Felt like a mouse playing in an elephant’s domain, but we were making progress. Thankfully the ship stopped its twist and started angling the stern towards the dock and away from us. Even though it was dark, I knew we were close to the middle of the channel because of the wave actions we were feeling. 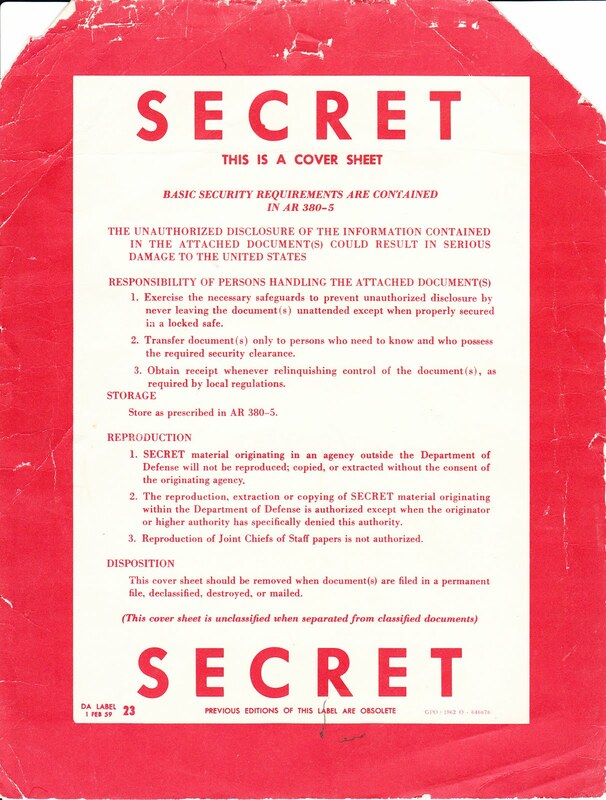 We were uncovered and not getting the protection of the intercoastal. Have you ever had the feeling someone was watching you? Well I was getting that feeling big time as we were paddling. I was really focused in on watching the cruise ship that was docking but it was the hair on the back of my neck that was giving me a creepy feeling. I couldn’t ignore it and turned and looked out toward the entrance of the channel. Oh my. OH MY. OOOHHHHH MY!!! ROD, GO GO GO GO!!!!!!! ANGLE STRAIGHT ACROSS THE CHANNEL!!!!!!!! I couldn’t believe it, I was staring at a massive dark bow of another cruise ship that was coming in behind the first one. I couldn’t believe that we had not seen it. We were so focused on the other ship that we didn’t see this one coming in. As I was paddling like a mad man, I couldn’t believe that the bearing on this ship was staying constant. In the maritime world, a constant bearing means you are on a collision course. I was both scared and really pissed. Scared because I knew the probability that the Officer on Deck of that ship could see our little stern lights, was slim to none. Especially with the lights of the other cruise ship as a back drop. Radar?! Shoot, we would’t be a blip on his radar and he wouldn’t be looking at it anyway this far into the harbor. The other thing that I knew was even if he saw us, he was in a confined space. He couldn’t slow down any more or he would lose rudder control. And if the decision was running us over, or ensuring his ship didn’t go on the rocks, I think we all know what he would decide. That’s what I would have done. I was really pissed off at myself for getting us into this situation. I know better. Who doesn’t? You look both ways when you cross the street so wouldn’t you do that crossing a channel? My situational awareness was flawed. Keep paddling, keep paddling. Put the anger to work paddling. Slowly but surely our bearing to the ship’s bow started to change. We were making progress and could see the waves of the shallow area on the north side of the channel. We were not going to be a bowsprit of the Love Boat! After catching our breath, we started paddling to the northern intercoastal connection from the port channel. Then we saw the blue lights of the port security boat coming for us. Sure could have used those lights five minutes earlier. I don’t know if we were in such shallow waters and paddling away from the channel that they let us go or that they just didn’t see us. Either way, they passed by us and headed towards the second ship coming in. Kayaks and canoes are hard to see at night because they are so low to the water and the little stern lights can be blocked by the paddler’s body. So it didn’t totally surprise me that they didn’t see us. I am glad they didn’t. I’d had enough excitement for the day and there were a lot more hours left in it. So, is Stage 6 of the UFC a fight? Great, the UFC is tough enough without having to deal with some turkeys who wanted to mess with us!!! I think there are different ways of dealing with confrontation. Some guys feel that it is best to give a verbal warning. Something like, “You mess with me and I will become your worst nightmare!” They hope that the verbal warning will convince the aggressive party to back off. Then there are some guys who are fairly large physically. You know, like the Incredible Hulk type, and they can just show themselves to the aggressive party and that is all that is required. Then there are some, such as myself, who are not as fortunate and don’t have an Incredible Hulk build, who take the strategy of walking softly and carrying a big stick. Now by big stick, I don’t mean actually having a big stick, although that wouldn’t hurt. I mean having a plan, which is the big stick, to deal with the aggressive party. So once I heard the intention of our new party friends, I wasn’t trying to figure out what to say, but trying to figure out how to turn the tables on their intended fun. Engaging a drunk has a positive and a negative. The positive is that they are not very coordinated and you can land some good shots on them. The negative is that they don’t feel pain and don’t have any fear. So you better make the shots you land count. So this unfortunately means shots that are debilitating. My first assessment was they were drunk. Oh yeah, and I think one of them just learned a curse word because that was the word he used for every third word. So how many? Sounded like three. I knew Rod had to be hearing them but I just assumed it would be a three on one fight until he got up. Hmmm, I don’t have my contacts in so they have a visual advantage. Hey, I have two bottles of foot powder that squirt out pretty good. Great, that will cause visual and breathing problems for two of them and maybe a third. I don’t have my shoes on. Will just have to ignore any pain in my feet. Hope there are not any sand spurs out there. They will most likely be coming from the front of my tent but I have a back entrance. Start opening the back tent flap. If one or two of them do come around to the back side, they will be between me and the sea wall. Not a problem. Blast out of the tent, spray powder in their faces and push them off the sea wall into the water. They’re drunk so their reaction time is going to be slow. The more of them we can push off the sea wall and into the water the easier it will be to manage the situation. Foot steps are coming……….. “Hey man, lets not do this. What the $%#2&!!!!! Really?! Let’s go back to the boat. Are you sure? Oh $#@%$ you! !” Footsteps leaving. Gee, for drunks they got smart all of a sudden and I am glad. Rod sleeps with a paddle in his tent, he is built like a little tank, and is strong as all get out. In the end I think the drunks would have gotten the worst of it if it had gotten physical. Plus, my father used to always tell me that cursing indicates the imagination of a fourteen year old. Maybe they were just young teenagers, I don’t know. Lesson learned… if in an area you think you will get hassled, sleep with a paddle. The rest of the night went without incident and my trusty 4:30 AM alarm signaled the start of another day. I think both Rod and myself were anxious about the 12 miles of open water in front of us. I did notice a slight wind but it was coming out of the east-south-east. Hey, we are heading north-east which means my big sail would work. For once we will have the wind to our advantage. If only it would stay slight and not increase in strength. We really didn’t want a bunch of big waves hitting us broadside on this crossing. As we were getting ready, one of the many lessons I learned was administered to me. I have always had a habit of pushing my boat into the water from the bow. The rudder is up so what’s the big deal? Well, the big deal is when it is dark, and you cannot see how far your rudder has been pulled up, and you are on a concrete ramp with grooves in it, your rudder might be just low enough to catch one of those grooves and then bend as you are pushing your boat down the ramp. Yep, now I have a rudder with a 45 degree angle in it. Great!!! Thankfully, my rudder is made out of soft aluminum so we were able to bend it back to about 15 degrees off-center. The disadvantage of soft aluminum is we were risking that it would break when we were forcing it back into shape. Lucky for me it didn’t. As we headed out, Rod and I had agreed to stay together. It would be safer and besides, we were enjoying each other’s company on this journey. I would be faster with my big sail but there had been multiple times that Rod had been faster than myself and he had stayed with me. This agreement was one that both of us honored throughout the UFC. This 12 mile stretch of water was really a weird one. We were a long ways from shore but even with that we would come across these very shallow areas where you could see the bottom very clearly and then we would cross over into these very deep cuts of water. It just wasn’t a place for a small little watercraft to be for long. If the weather turned nasty there was no bailout anywhere close by. As we were approaching Miami we did see something very odd. We saw these structures out in the water. 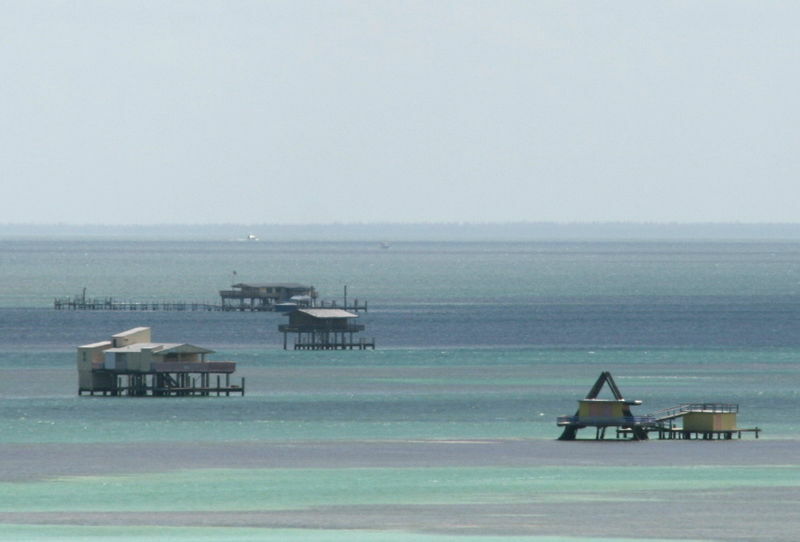 It was a place called Stiltsville. Interesting history associated with these structures and I am amazed that the structures have survived all the hurricanes. This link will take you to a description of the place. http://www.nps.gov/bisc/historyculture/stiltsville.htm I know they had no trespassing signs on these structures but if it was real bad and that was the only bailout option, I am afraid we would have become temporarily illiterate. I think both Rod and I were feeling better as the buildings of Miami started to get closer and closer. I kept thinking all we had to do was get into Miami and we will have the protection of the inter coastal waterway (ICW). We would have it made if we could just get into Miami. Especially since the winds were starting to pick up and the waves were also starting to get bigger. It just seemed to go so slow which is how it is in a kayak or canoe. You are moving at 4mph at best and you can see these structures for several miles out. You think you will be there is 30 minutes when in reality it will be a couple of hours. We started to get into the ICW but were we in for a surprise. In doing the UFC, Rod and I got a feel for the different types of boaters in different areas. 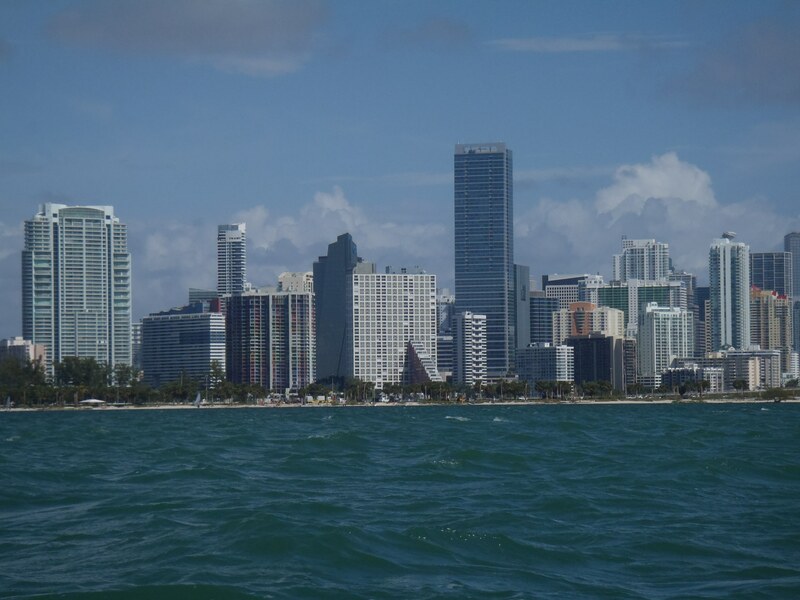 Miami has to be right up there for having the most inconsiderate boaters in the state. They could care less about their wakes. It seems like the maritime rules of the road they follow are, “I have the biggest boat so I have the right to the water way and I can run my boat however and wherever I want.” Oh, and then there were the boats that had so many people lip-locked and other various states of being spread out on the boat that I don’t know how the Captain could even see us. Hey, they couldn’t see us, that’s why we had so many close calls. 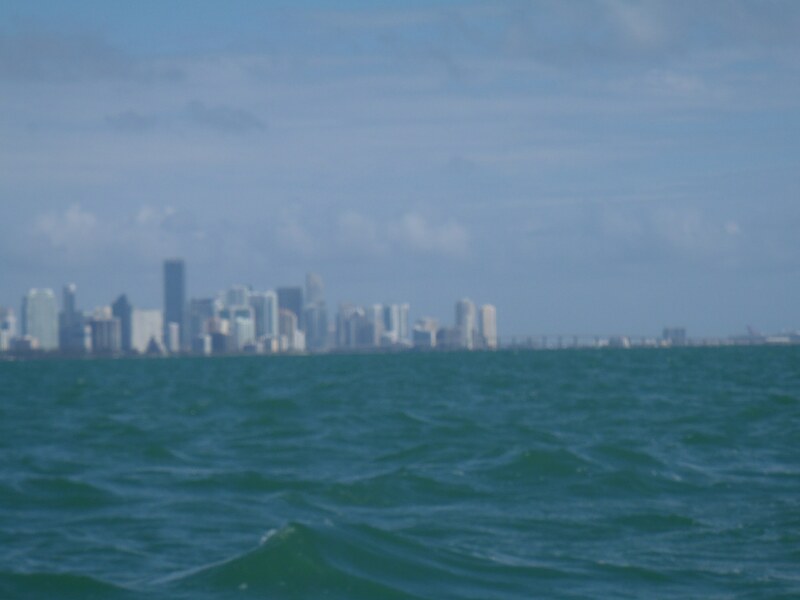 What I thought was the most dangerous stretch of water, the open water of Biscayne Bay, was a cake walk compared to the waters of Miami. Now I was wishing we were transiting these waters at night because the boat traffic would be down. We finally got through to Miami and stopped at a spoil island in the Miami Shores area. We needed a break but this island seemed no different than what was happening on the boats. It was party central with radios blaring, jets skis running all over the place throwing wakes up, and couples…….. They must sell a lot of lip balm and sunscreen in Miami to address all the lip-locking and to protect skin that doesn’t normally see sun light. The sad part was all the trash on the island. I guess they expect someone else to pick it up and that someone else never comes. After a quick snack and some readjusting of gear, we were back on our way. The further north we progressed up the ICW, the better protection we got from the wind due to the narrowness of the ICW. It was kind of odd paddling past these nice restaurants with these open docks that over look the water. Couples would be having a candlelight dinner overlooking the water and then silently Rod and I would paddle by only a coupe of feet from them. The looks that we got was priceless. The narrowness of the waterway was great but now that we were in a populated area we had another problem. Finding a camping site. There were no open stretches of land to stop and camp on. After last night we wanted something secured that would give us some comfort that we would not be messed with ( either by the local police, condo security or the local homeless community). 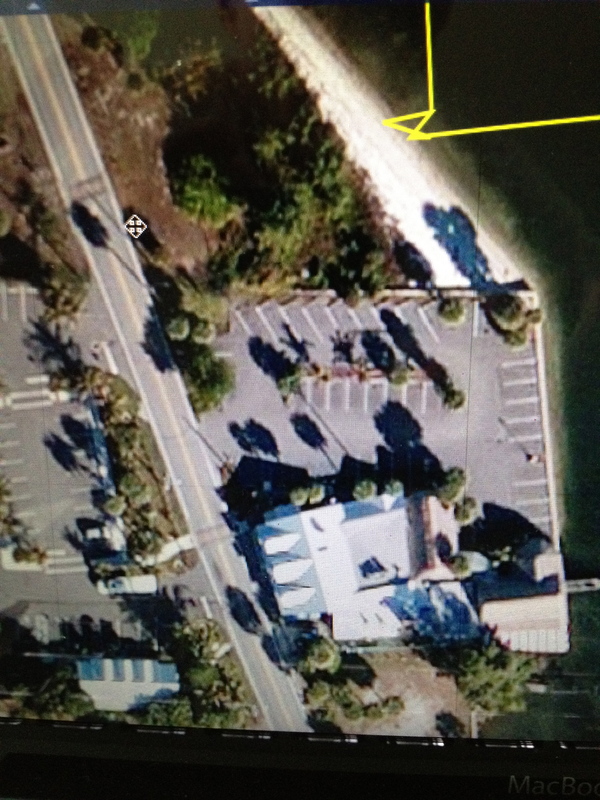 I thought we were going to have to paddle all night when Rod noticed a boat ramp that was part of a park. It was late, we were tired, sp the park it was. We pulled our boats up and started unloading our gear. The place looked ideal. There was fresh water available by a fish cleaning station, there were bathrooms that were open and a coke machine. The place wasn’t near any major roadways that we could see. The we saw the headlights of a truck coming. The truck was white and had a symbol on the side of it. Great…………..